Having a circus themed party? Roll up, roll up! 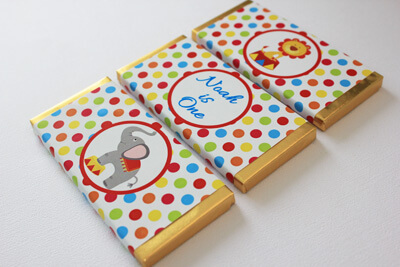 These gorgeous circus fun design personalised chocolate bar favours will make the perfect addition to your day. You will receive alternating patterns including a lion, elephant and your own choice of text. Thank you so much for the great service and quick delivery! I love my wedding favours!